To adjust the recurrence settings of an existing series, follow the steps below. Open a content item that is part of the series you wish to modify. From the Divvy Sandbox, click the Series tab. In the right column, click the blue Edit Settings button to activate the edit mode. Make your necessary changes, then press the green Save Changes button. 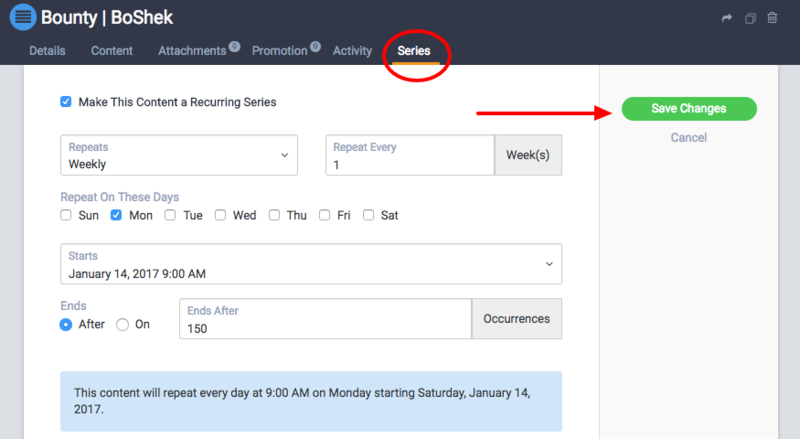 For more information about the recurring series feature, refer to our deep-dive article. Important Note: Changes to a recurring series will only effect current and future content items in the series. The changes are not retroactive.